Without a doubt, it is not just the quaint urban landscape and the many opportunities it gives travellers to enjoy both luxury and business-oriented stays that attracts visitors to Doha, the capital city of Qatar. More than that, it is more likely that the world honestly marvels at the frantic pace at which it went from pearl fishing village to becoming one of the most developed cities in the Middle East. That being said, it must be underlined that its rich cultural heritage has been wisely preserved while growing as a destination boasting a top-quality hospitality offer. In addition, its proximity and good transport connections to Hamad International airport, the current primary base of the renowned global carrier Qatar Airways, make it ideal for a Middle East adventure. By way of example, the journey to Doha city centre from the airport lasts 20 minutes on average and can be done by taxi, shuttle, and limousine or by taking the Express circular route 777, dedicated to passengers arriving through HIA and transferring to the downtown. Also, a metro line that will cover this distance is currently under construction and planned to start operations later on this year. To help you find the perfect accommodation for your trip –no matter if you travel for leisure or work purposes-, we have selected some recommended hotels in Doha city centre that stand close to the main sights and attractions and may adjust to different travel budgets. See the details below. 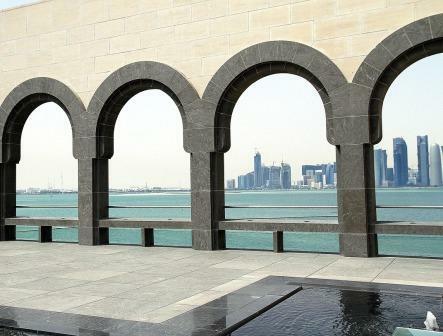 The Green Garden is a 3-star accommodation conveniently situated in the Corniche District and just a short drive to the Qatar National Museum and the Emiri Diwan Royal Palace. Aside from access to spa facilities for a nominal fee, an onsite restaurant serving meals that can be adapted to specific dietary needs and the possibility to enjoy breakfast in bed every morning, this hotel in Doha provides fully-fitted guest rooms with free WiFi network, air conditioning, TV with satellite channels, coffee maker, wardrobe and private bathroom. Units can be either standard or deluxe rooms, some of which feature beautiful city views, and in the case of family ones they may accommodate up to six members of the same group together. The Horizon Manor is strategically located right across the street from the Islamic Art Museum in Doha, and offers convenient airport transfer services to confirmed guests so that they can travel to and from the HIA Qatar facilities quickly and comfortably. This hotel in Qatar is frequently chosen by travellers due to the breathtaking views over West Bay and the seaside promenade that the building affords, as well as its fully-equipped double rooms, family units and suites featuring noise isolation and temperature control technology, a spacious living area, work desk, mini bar, TV and round-the-clock room service. During their stay, guests also benefit from other amenities such as complimentary wireless internet, a swimming pool, a gym and the chance to indulge in international dining options. Travellers with a reservation to stay in this hotel near the Doha Fort and the popular Souq Waqif may request to be picked up at Hamad International airport for a surcharge, thus saving precious time to start enjoying their trip as soon as possible and commuting without concerns no matter how many bags they are carrying. This hospitality establishment puts spacious rooms and a varied daily continental breakfast at the guests’ disposal, but among other major perks of staying in this hotel in Doha we count an onsite fitness & spa centre, the availability of personal trainers for an extra charge, an indoor swimming pool, complimentary WiFi all throughout, a business centre, safety deposit boxes, welcome free bottled water, chocolates and fruit upon request and a wide array of nearby restaurants, including a Starbucks Coffee outlet. Will you be visiting the United Arab Emirates as part of your Middle East tour? Then we invite you to take a look at our tips and recommendations for Abu Dhabi and Dubai.